ORLANDO, Fla., Dec. 29, 2017 /Christian Newswire/ – The Southern Poverty Law Center (SPLC) has a so-called "Hate Tracker" webpage, which purports to track social media communications of groups that SPLC hates. The "Hate Tracker" page includes the following social media hashtags: #christmas, #merrychristmas, #merrychristmaseve, #jesus, and #whitegenocide and #ineedwhitesupremacybecause this week. 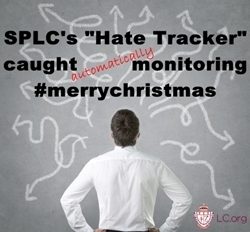 The SPLC claims it monitors social media communications of so-called hate groups and now claims that the #christmas, #merrychristmas, #merrychristmaseve, and #jesus hashtags are due to a so-called algorithm, but the SPLC cannot run from the clear intent of its "Hate Tracker" page. The SPLC website plainly states that it is a "Hate Tracker" and, when narrowed to specific days, on December 24th, #merrychristmas held the No. 2 ranking. On December 25th, #merrychristmas was ranked No. 1 and on December 26th, it was ranked No. 3. After Liberty Counsel and other media sources challenged the SPLC, it now claims the rankings are created with an automatic feed of popular tweets among those it claims are hate groups, and that the "Hate Tracker" webpage doesn't actually track hate; it just tracks what is being tweeted by supposedly hateful people. There is further evidence, however, of the SPLC manipulating its website. On its December 27th page, the SPLC claims that the 12th highest "trending hashtag" among all the so-called "hate groups" it claims to monitor is "#ineedwhitesupremacybecause." However, when fact-checked on Twitter, there were only two tweets on the 27th that used that hashtag across all of Twitter. Of the two Twitter users on December 27th who each tweeted it, one's profile claims to be from New Zealand, and the other's chosen name is "@BakedNorwegian." This indicates that both users, if not internet bots, could be international accounts. However, on SPLC's page are NO Twitter accounts mentioned with that hashtag, and NO images found, even though one of the two Twitter users posting the hashtag "#ineedwhitesupremacybecause" INCLUDED an image with their tweet. This indicates that SPLC's claimed "algorithm" does not automatically pull all images. These inconsistencies raise serious questions about the SPLC and its misrepresentation of the groups they "monitor," the algorithms used, and the complete ineffectiveness of the organization to track what it claims. The SPLC cannot hide behind a so-called algorithm because the SPLC has final editorial control of its webpage. Here are the facts: The SPLC's webpage is titled "Hate Tracker." The web address is hatetracker.io and it displays the words "Hate Tracker" and its Twitter name @splchatetracker on each of its pages. It also ranked #merrychristmas in each of its top three highest-ranking positions on its "Hate Tracker" website this week. In addition to hashtags, the SPLC has a section on images that contain the following warning: "This view shows images posted with trending hashtags during the selected time period. WARNING: This content may be upsetting. We have restricted the view to prevent offensive content from being viewed in full. These images may be pulled from accounts that are not necessarily part of the far-right population we monitor." (emphasis added). Included on the image page are the following "upsetting" images: (1) a large lighted Christmas tree with two angels set up in a public venue; (2) a dog wearing a Santa hat and another dog with reindeer antlers; (3) first lady Melania Trump wearing an elf hat; (4) a large lighted Christmas tree inside a building; (5) Marines pushing up a Christmas tree; and (6) a sleeping baby in a "National Right to Life" Christmas outfit. The SPLC cannot blame this page for an algorithm. An algorithm did not write "WARNING: This content may be upsetting." The SPLC chose to place this warning on a page that included Christmas images. The message SPLC is sending is the same one that appeared in a recent Newsweek article entitled, "How Trump and the Nazis Stole Christmas to Promote White Nationalism." In that article, Christina Maza writes that "critics" (which includes herself) say that President Trump's "crusade to bring back Christmas is part of a larger attempt by the president to define America as a country for white Christians alone." She goes on to say, "Wishing people 'merry Christmas' instead of 'happy holidays' is thus in line with Trump's decision to ban citizens of Muslim-majority countries from entering the United States," and "it fits neatly with his refusal to condemn white supremacists when they march against diversity, and with his condemnation of athletes who protest police brutality against black men." Yet, Christmas is a holiday celebrated around the world by people of different races, ethnicities, cultures, political ideologies, and even faiths. The SPLC's agenda willfully combines pro-family, Christian, and/or conservative groups and leaders with the KKK, white supremacists, and Neo-Nazis in the mind of the public to damage the reputations of good people who oppose violence. The SPLC's false labeling is as damaging as it is mistaken. It targeted the Family Research Council (FRC) with its rhetoric and then in 2012, Floyd L. Corkins II went on a shooting spree at FRC with magazines full of ammunition and Chick-fil-A sandwiches intent on committing mass murder. When he arrived at FRC, he aimed his gun at Leo Johnson, an African-American security guard who ducked away and then, with a gunshot wound in his arm, subdued Corkins. Corkins later admitted to the FBI that he targeted FRC and other groups, whose addresses were found in his pocket, using the SPLC's "Hate Map" website. The SPLC's rhetoric turned deadly again this summer. It incorrectly identified U.S. Representative Steve Scalise as a white supremacist, and then one of SPLC's Facebook followers, James Hodgkinson, shot and wounded Rep. Scalise and attempted to kill many more people at a baseball field this summer. But even in these situations, the SPLC will not accept responsibility for its irresponsible rhetoric. "The SPLC's false 'hate' labels have resulted in violence against innocent people. Instead of stemming the evil of hate, the SPLC fans the flame," said Mat Staver, founder and chairman of Liberty Counsel. "The SPLC operates by associating peaceful, nonviolent groups alongside hateful, violent groups and thus seeks to connect the two in the minds of the public. This is precisely the intent of its so-called 'Hate Tracker' and 'Hate Map,'" said Staver. The SPLC has been thoroughly discredited by journalists from the political left and right and the federal government, much of which is included in a website compiling the truth about the SPLC. Another website exposes the SPLC's hypocritical and misleading tactics. In addition, Liberty Counsel has created a page answering SPLC's false, name-calling of its non-profit Christian ministry and its pro bono work in the legal field. Liberty Counsel believes that every person is created in the image of God and should be treated with dignity and respect.